...In 1951, Ray was divorcing Gloria Grahame, his second wife. His career seemed to be spiraling downward, becoming a Mr. Fix-It for Howard Hughes, working on films like "Jet Pilot," "Macao," "His Kind of Woman" and "The Racket." The one personal film that did come out of this period was "The Lusty Men," a work thematically right for Ray, with Robert Mitchum as an itinerant sensitive loser who comes to learn, you can’t go home again. AT THE END OF HIS RKO CONTRACT RAY WAS ABLE TO TURN "THE LUSTY MEN" INTO ANOTHER PERSONAL STATEMENT. HE CONNECTED WITH THE MATERIAL IN A WAY THAT WASN’T TRUE OF "BORN TO BE BAD," "A WOMAN’S SECRET" OR "FLYING LEATHERNECKS." HE BENEFITED FROM THE INPUT OF PRODUCER JERRY WALD, WHO HAD CREATED THE IDEA FOR THE FILM. EVEN THOUGH RAY AND WALD HAD AN UNEASY RELATIONSHIP, RAY HAD MORE CREATIVE LEEWAY THAN USUAL. 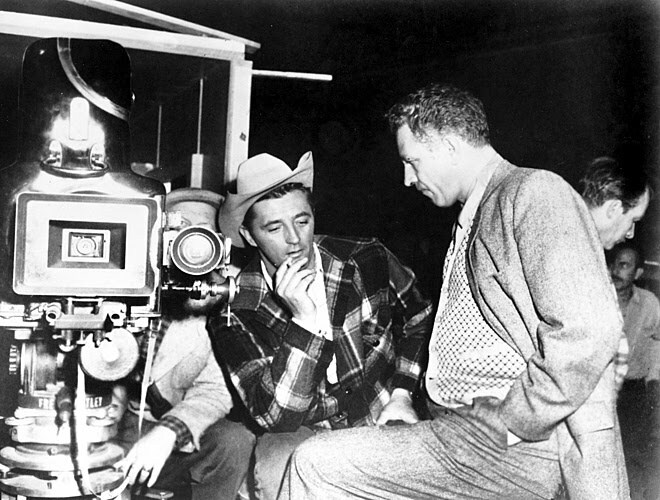 THE DIRECTOR ALSO ESTABLISHED A SPECIAL CLOSENESS WITH ROBERT MITCHUM. RAY NEEDED TO BOND WITH HIS USUALLY MALE STARS, AND WHENEVER HE HAD WHAT I CALL IN THE BOOK A 'TWO-MAN CLUB' (RAY AND BOGART, OR MITCHUM, OR JAMES DEAN, OR JAMES MASON TO AN EXTENT) THE FILM WAS ELEVATED. There was plenty of innovative use of the camera by Ray in this film. You write about how he strapped a 16mm camera on to a bronco rider giving us a view of what it’s like to ride a wild horse. There are plenty of other instances of his unique use of the camera which I find to be one of his most poetic.